Thyroid, Parathyroid, Adrenal, Endocrine Surgery, How is a traditional parathyroidectomy performed? The procedure is performed under general anaesthesia with an endotracheal tube or laryngeal mask (please see anaesthetic section). The patient is supine with a 20% tilt of the head in an upward position. A shoulder support is placed between the shoulders, and the head supported on a ring with the neck extended. If there is any evidence of cervical bone disease this is omitted. Approximately 1 cm above the breastbone a 4 cm incision is made through skin and platysma. Care is taken to avoid the cutaneous branches of the cervical nerve plexus, as damage to these nerves results in numbness in the front of neck, which can cause difficulty for men when shaving. The incision is so small that the anterior jugular veins are easily avoided and rarely damaged. The skin and platysmal flaps are raised down to the base of the sternal notch and up to the thyroid cartilage. The mid-line between the sternohyoid strap muscles is found low in the neck and the central fascia divided (this a totally bloodless procedure). The sternohyoid muscles are separated on both sides from the sternothyroid muscles until the descendens hypoglossi nerves and internal jugular veins are clearly seen. While separating these muscles a significant blood vessel is divided with diathermy at the upper end of the field. Rarely is there a need to divide the strap muscles. 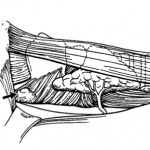 Separating the strap muscles from underlying thyroid tissue using a combination of sharp and blunt dissection demonstrates the anterior surface of the thyroid. If present the middle thyroid vein is divided. To aid identification of the parathyroid, a stay suture may be placed in an area of normal thyroid tissue (not forgetting the high incidence of thyroid nodules in hyperparathyroidism). If at all possible the recurrent laryngeal nerve should be identified before any tissue is removed, particularly as it is an excellent guide to the parathyoids. Upper glands lie behind the plane of the nerve and lower glands in front of this plane. If a normal parathyroid is seen it should be clipped at its apex with a small titanium clip (normal parathyroids must not be removed, although they may be biopsied). Upper parathyroids are quite constant in position, 80% lying within a 2cm radius of the point of transection of the inferior thyroid artery by the recurrent laryngeal nerve. On rare occasions enlarged upper parathyroids may be found behind the oesophagus and even in the posterior chest. The aim of the dissection should be to identify all four parathyroids, be they normal or abnormal. The tendency for parathyroids to be symmetrical in their position is a great help in identifying wayward parathyroid glands. In most cases the dissection is straightforward and the parathyroid tumour found within a short time of opening the neck. The parathyroid is subjected to frozen section confirmation and the wound closed after careful haemostasis. 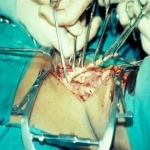 The wound isinfiltrated with local anaesthetic and adrenaline to aid postoperative analgesia. What is the specialist approach to parathyroid surgery? 1. The parathyroids are usually symmetrical. If a normal parathyroid is found mark it immediately, if you don't you may not find it two minutes later! Having marked it, when you look on the other side you will often be surprised how easy it is to find the opposite parathyroid. Do remember that a huge parathyroid tumour may be mistaken for a thyroid nodule. 2. When exploring neonates or very young children remember that a normal parathyroid is only 3-5mgs in weight, so that any parathyroid tissue that looks similar to a normal adult parathyroid is ten times bigger than normal. Also in the very young we have found that the parathyroids tend to lie on the front of the thyroid. 3. When using the IOPTH remember there is a catch. Despite the IOPTH falling to normal there can be a "silent" second adenoma on the opposite side.Unless you are using the Video assisted approach you will close the patient thinking that you have cured the patient only weeks or months later to be presented with recurrence of the hypercalcaemia. This occurs in less than 0.5% and is easily cured by a second operation. 4. When three normal or hyperplastic glands have been found and the upper parathyroid is missing, look behind the oesophagus and pharynx. If the lower is missing open up the carotid sheath from the carotid bifurcation down to the upper mediastinum. Remember it is not always possible to be sure whether an upper or lower parathyroid is missing, but the relationship of the glands to the recurrent laryngeal nerve can help. If the fourth gland still cannot be found, perform a cervical thymectomy on the side of the missing parathyroid. 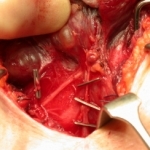 Cervical thymectomy is easy to do with virtually no complications. Identify the thymus at the lower pole of the thyroid. Thymic tissue has, unlike fat, a distinct structure to it. Separate the thymus from the thyroid and divide the thyro-thymic ligament, pick up the upper end of the thymus and pull it by continual traction out of the chest. As the thymus is delivered a single vessel is seen posteriorly and divided. 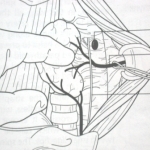 Thymectomy should be virtually bloodless and often produces the missing gland. In parathyroid hyperplasia it is our policy to perform bilateral excision of both thymic lobes even though four glands have already been found. If after all this dissection the fourth gland is still missing, perform a total lobectomy of the thyroid on the relevant side in the hope that the missing gland is intra-thyroidal. If significant parathyroid pathology has still not been found, it is wise to stop and check the diagnosis of hyperparathyroidism. The exception to this rule is severe fulminating hyperparathyroidism or patients with definite scan evidence of mediastinal tumours. In these situations the sternum should be split. When splitting the sternum do not split more than the manubrium. We have presented in 2009 that splitting the munubrium alone is often all one needs to retrieve a low mediastinal parathyroid. 5. If exploration of the mediastinum through a sternal split does not reveal the offending tumour in the anterior mediastinum, consider dividing the left innominate vein and dissecting down between the pulmonary artery and aortic arch. One may find a central mediastinal parathyroid here. 5. When re-exploring cases do not use the normal approach. Re-open the skin incision in the normal manner, then approach the lower pole of the thyroid by opening up the plane between the sternomastoid and the strap muscles, divide the omohyoid muscle as it runs over the internal jugular vein and then transversely divide sternohyoid very low in the neck, starting laterally and working medially. Once sternohyoid is divided repeat the exercise with the sternothyroid muscle. As the dissection deepens the muscular fibres are replaced by tendinous looking tissue - this is a warning sign for great care because one is now very near the trunk of the recurrent laryngeal nerve. One should now dissect out the carotid and identify the vagus. 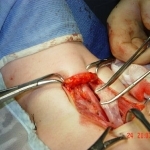 Despite previous surgery the recurrent nerve is usually found with great ease in the angle between the carotid and the medial trachea.Our own view is that the nerve and its branches should be traced throughout the operative field before a search is made for the missing parathyroid tumour or tumours. Do not forget that if you cannot find a nerve trunk low on the right side, the recurrent nerve may be entering the larynx directly from the vagus without passing under the subclavian artery (the non-recurrent laryngeal nerve). The nerve will be found high up in the neck and its course near the thyroid is similar to the inferior thyroid artery. 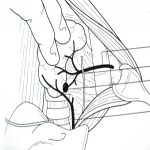 Intraoperative PTH sampling should preferably be available in re-operative cases. 6. Thyroid pathology is common in patients with parathyroid disease; it should be dealt with on its merits with the liberal use of rapid section pathology (frozen section).